Copper is a reddish brown nonferrous mineral and is closely related to silver and gold. Its name was derived from Kyprios, the Ancient Greek name for Cyrus, an island which had highly productive copper mines. With an atomic number of 29, it belongs to the transition metals. It is highly conductive of electricity and heat. In addition, copper is a vital dietary nutrient as it appears in several enzymes, facilitates the absorption of iron, and helps to transmit electrical signals in the body. This mineral helps the body make red blood cells and keeps nerve cells and your immune system healthy. However, only small amounts of this are needed because high doses can be extremely toxic. 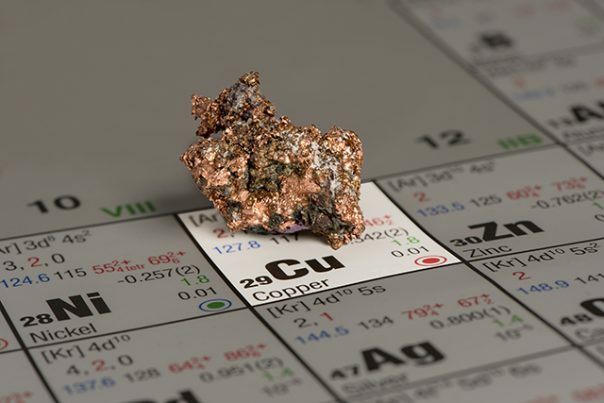 Copper is rarely found pure in a natural state. Usually, it is compounded with other elements, and it must be treated before it can be sold. Copper can be found in foods like oysters, liver, whole grain breads and cereals, shellfish, dark green leafy vegetables, dried legumes, nuts, and chocolate. Copper supplements help people with anemia because of copper deficiency. The mineral works together with iron to form red blood cells. Taking copper with zinc, manganese, and calcium might help slow the rate of bone loss among postmenopausal women, although evidence are few. Copper reduces the symptoms of arthritis which relates to its anti-inflammatory actions. This mineral is also essential for normal growth and health. Moreover, it is also helpful for the protecting the skeletal, nervous, and cardiovascular systems. Copper is a vital component of the natural dark pigment melanin, which imparts coloration to the skin, hair, and eyes. Taking copper supplements may help in protecting against graying of the hair and maintains the color of the eyes. In addition, copper prevents premature aging because it is a strong antioxidant. It works with the antioxidant enzyme superoxide dismutase to protect the cell membranes from free radicals that attack many organ systems. The mineral is good for the skin as it also plays an important role in the synthesis of hemoglobin, myelin, body pigment melanin, and collagen. Copper is known to increase the production of energy. It is essential for the synthesis of adenosine triphospate which is an energy storage of the human body. Studies show that copper boosts the immune system. It was found that copper can destroy or inhibit the growth of bacterial strains such as E Coli. It is also a vital part of the healing process and ensures better wound healing. It is a good immunity builder which allows the body to defend itself better and heal itself faster. The mineral is also good for the endocrine system as it also plays an important role in ensuring the proper function of thyroid gland. Furthermore, copper helps in the improvement of the circulatory system. It is essential in the production of red blood cells, hemoglobin, and bone matter. The reason for this is its role in the absorption of iron from food sources. Lastly, studies showed that it can lower the levels of bad cholesterol and help increase the good cholesterol. Thus, reduces the risk of cardiovascular diseases like atherosclerosis, heart attacks, and strokes. Copper toxicity: Are you getting too much? Copper, a mineral found in foods such as oysters, liver, and nuts, can help prevent anemia, arthritis, and high cholesterol. It is good for the nervous, circulatory, and immune systems.